The fourth pitch day in San Diego — Plug and Play’s first U.S. satellite location —featured 24 startups, after a no-show by Match Blood. The pitches were for medical devices, a platform to bring Bitcoin to the masses, a marketplace for lab and equipment sharing, and an online hub for photographers. And what San Diego event would be complete without drones? The panel of 13 judges included Plug and Play Technology Center founder Saeed Amidi and Managing Partner Alireza Masrour, as well as Qualcomm Inc. (Nasdaq: QCOM) executive Nathan Fletcher; Howard Leonhardt, founder of Leonhardt Ventures and the California Stock Xchange; and Alex Roudi, CEO of Interwest Capital. 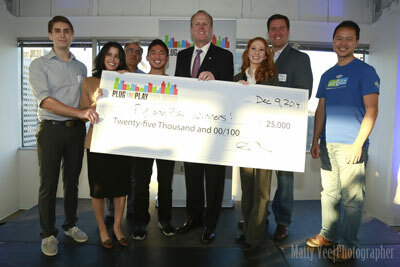 Mayor Kevin Faulconer with the seven winners of Plug and Play San Diego's fourth pitch event Tuesday, who each received a $25,000 check and a spot at Plug and Play's EXPO in Sunnyvale. Photo courtesy of Matty Vee. Each company had three minutes to show its wares after about two minutes of judges’ questions. The judges then deliberated and San Diego Mayor Kevin Faulconer made a guest appearance to announce the winners. As in past Plug and Play pitches in San Diego, there is no set number — or guarantee — of winners; any or all startups could win the prize. Hush Technologies: Quickly becoming a crowd favorite, Hush, the creation of three UCSD students, is the world’s first smart earplug, combining white-noise generation with sound-blocking technology for a better night’s sleep, while syncing up with your smartphone so that you — and only you — can still hear your alarm and emergency notifications. The company launched a $100,000 Kickstarter campaign in November, and has already far exceeded that with nearly $500,000. Fandom Gaming: Staples Center was sold out in one hour and 32 million additional people watched a "League of Legends" video game tournament from home. Fandom Gaming wants to tap into this massive market by creating a fantasy sports platform for video games. The company, which would take a percentage of entry fees into tournaments, plans to launch its AlphaDraft game in January. eLux Medical: The product of a UCSD professor’s research and personal struggle to lose weight after having a child, eLux is developing NanoLipo, a device that uses gold to remove twice the amount of fat in half the procedure time of traditional liposuction without the unwanted cosmetic effects on skin. The product has been tested on pigs and may go to human trials soon, with an anticipated launch date in early 2017.
nPruv: The pharmaceutical industry and medical centers often have trouble finding patients for clinical trials, and desperate patients have no easy way to find applicable trials they could participate in. Enter nPruv, the Match.com for clinical trials, connecting the two groups and saving the pharma industry billions of dollars. Airbitz: With the goal of bringing Bitcoin to the masses, Airbitz combines a mobile Bitcoin wallet with a merchant directory and secure, easy-to-use system. nCore Communications: nCore uses a small cell-base station to allow mobile operators to support LTE coverage over Wi-Fi radio. Seraphim: This startup creates collapsible drones that are small enough to fit on your wrist but then open out with wings so the device can follow you around, capturing footage. Besides their fold-up size, the drones are notable for a 45-minute flight time — longer than most others — and a sense-and-avoid capability so it doesn’t run into trees or other structures.